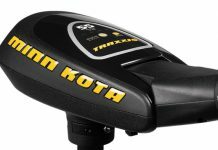 In business since 1934, Minn Kota is the oldest manufacturer of trolling motors in the world. The Minn Kota Maxxum is a good example of why they have been in business for so long. It was designed for strength, durability, and performance, with an impact-resistant composite head and a marine-grade aluminum spine. The Maxxum is a bow-mounted, fresh-water engine that cuts through underwater growth, and that features an extremely quiet operation that does not scare off fish. The Digital Maximizer allows the engine to run longer without draining the battery. If you are shopping for a new engine, consider the Minn Kota Maxxum. 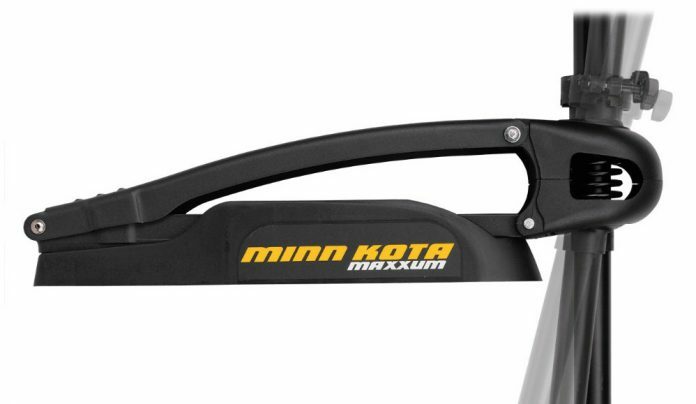 The Maxxum Mount uses Minn Kota’s Latch and Door design to securely attach the motor and to make it easy to remove. It has a soft-grip knob and several pre-drilled holes that should allow you to attach it without drilling new holes in your boat. It has been tournament-tested and will cut through any conditions. When stowing the Maxxum, the mount will not flex, budge, or vibrate. 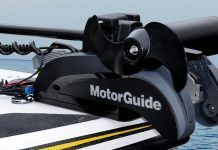 The BOWGUARD 360° protects the bow of your boat should the motor be hit from any angle. It will break away and automatically reset, and it is easy to remove. With it’s dual-density system, the Bowguard 360 also helps eliminate noise. The Digital Maximizer works with the three speeds of the variable-speed motor to minimize the power used and allow longer fishing trips. You set the speed, and the digital maximizer adjusts the power to conserve the battery. The other two speed control options are the five-speed with five speed settings and the 5 Fwd/3 Rev with five forward and three reverse speed settings. The Maximum is available with either a hand or a foot control. The hand control allows you to control the boat while standing. The hand control has an 18-foot cord and the Push-to-Test Battery Meter that lets you know how much battery you have used. The foot pedal is a heel and toe control with a five foot cord and an Illuminated Directional Indicator on the motor. The swept-back and flared blades on the Weedless Wedge™ 2 push aside even the thickest underwater growth without draining the battery. It is easy to install, so you can purchase a spare and have it with you in case of an emergency. The composite shaft flexes on impact, surpasses steel in strength, and is guaranteed not to kink, break, or corrode for life. Shafts come in varying lengths. Getting the right length shaft is important to prevent cavitation. Cavitation occurs when the pressure from the propeller creates air pockets in the water. When these air pockets implode, they create shock waves and noise that scare off fish. To prevent cavitation, the top of the motor should be submerged 12″. 0″ – 10″ from bow to waterline, requires a 36″ shaft. 16″ – 22″ from bow to waterline, requires a 42″ shaft. 22” – 28″ from bow to waterline, requires a 48″ – 52″ shaft. 28″ – 34″ from bow to waterline, requires a 54″ – 62″ shaft. 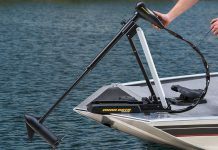 The Minn Kota Maxxum has a limited lifetime warranty on the composite shaft and a limited two-year warranty on the rest of the motor for the original purchaser. It covers parts but not labor, normal wear-and-tear, or blemishes that do not affect the operation of the engine. Since this is a fresh-water engine, the warranty is void if the engine has been used in brackish or saltwater. Engines used for rental or commercial purposes are excluded. Any damage caused by shipping, accident, or modifications are also not covered. All service work must be done by an authorized service center. Other exclusions and limitations may apply. 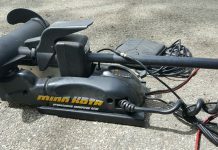 The Minn Kota Maxxum is a bow-mounted motor. 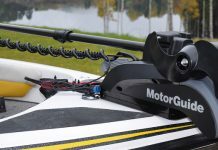 It pulls the boat rather than pushing it, so it offers quicker response, better control, and easier positioning than a transom-mounted motor. The extra large commutators and windings keep it cooler, which extends battery power and motor life. It runs quietly because of the specially designed bearing system, so it will not scare off fish. However, because it is a fresh-water engine, it is not made with the materials or in the manner necessary to last in brackish or saltwater. Using it in brackish or saltwater could damage it or lead to corrosion. The Maxxum 80 with 80-pounds of thrust, a 24 volt battery, and a 42″ or 52″ shaft length. The Maxxum 70 with 70-pounds of thrust, a 24 volt battery, and a 42″ or 52″ shaft length. The Maxxum 70/SC with 70-pounds of thrust, a 24 volt battery, and a 42″ shaft length. The Maxxum 80/H with 80-pounds of thrust, a 24 volt battery, and a 52″ shaft length. The Maxxum 70/H with 70-pounds of thrust, a 24 volt battery, and a 52″ shaft length. The Maxxum 55/SC/H with 55-pounds of thrust, a 12 volt battery, and a 52″ shaft length. The Minn Kota Maxxum is one of the best bow-mounted, fresh-water trolling motors available. 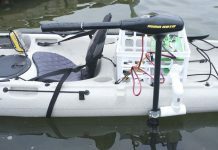 It is durable, moves easily through underwater vegetation, and runs quietly, so it does not chase fish away, and it has the Digital Maximizer that preserves the battery charge for a long day of fishing. It is a motor that you really should consider buying.